Each year our Eighth Grade Student Council leads the student body in a school-wide fundraising project in support of a cause or organization of their choice. This year, the boys are working to support The Wounded Warrior Project, an organization that offers free programs to our veterans who were wounded during their service. The project kicked off last week when a guest speaker from Wounded Warrior met with the boys in Grades Three through Eight. The boys were inspired by the veteran's story and his resilience. 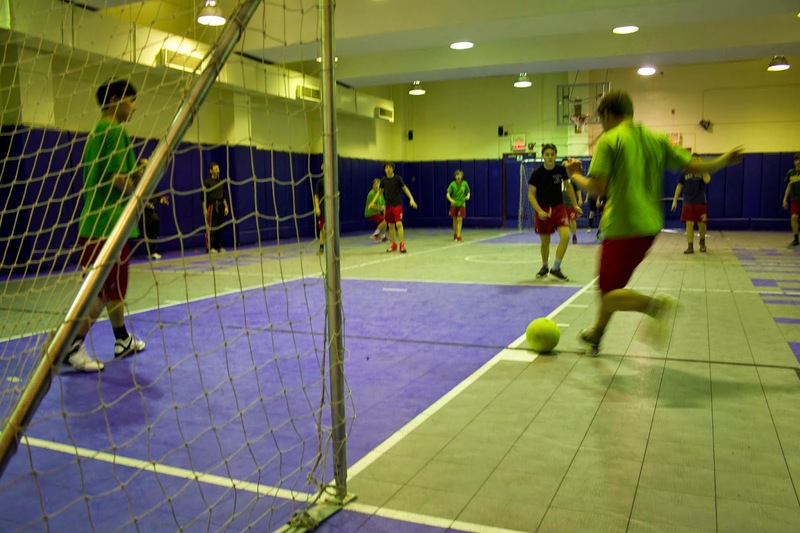 That same day our eighth graders held a soccer tournament to raise funds. Today, Student Council officers sold Warrior Project t-shirts, lapel pins, and wrist bands for a voluntary donation in the front lobby. Taking action for the common good is an ideal at Saint David's; it is the way our spirituality pillar is made concrete. This year our boys will also continue to support the Saint David's Kalina School in Ethiopia, which opened last year after four years of fundraising by Saint David's boys. Morning sale to raise funds for WWP. Our boys engage in many service projects: selling pies and collecting canned food for the Thanksgiving Food Drive, visiting seniors at Carnegie East, volunteering at Cardinal Cooke, fundraising for Pennies for Puppies, and the Eighth Grade project are but a few examples. I am always struck by the zeal with which our boys engage in these projects, and their recognition that in order to "be good" one must "do good." 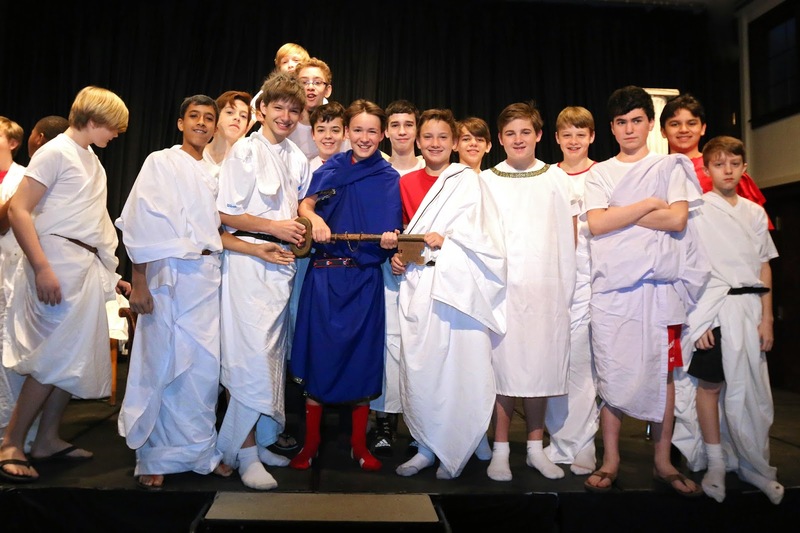 Directed by their teacher Jim Barbieri, 7 Theta presented The Trial of Socrates last week, in conjunction with their study of ancient Greece. The play is a historical reenactment of the trial of Socrates, the ancient Athenian philosopher who was put to death for questioning the religious beliefs of Athens and for corrupting the young. The play's themes center on the importance of remaining true to one's convictions and on having the freedom to pursue truth and knowledge. These are themes that resonate with the ideas and ideals of our school. The boys did a superb job. Congratulations to Thomas F. (Socrates), Devin K. (Cristobulus), F. Duggan (Chaerophon), George N. (Plato), Ryan G. (Guard), Charlie P. (Xanthippe), Brij G. (Lycon), Ben D. (Anytus), Niall S. (Meletus), Liam M. (Archon) and the rest of the cast who introduced the play by providing its historical background. 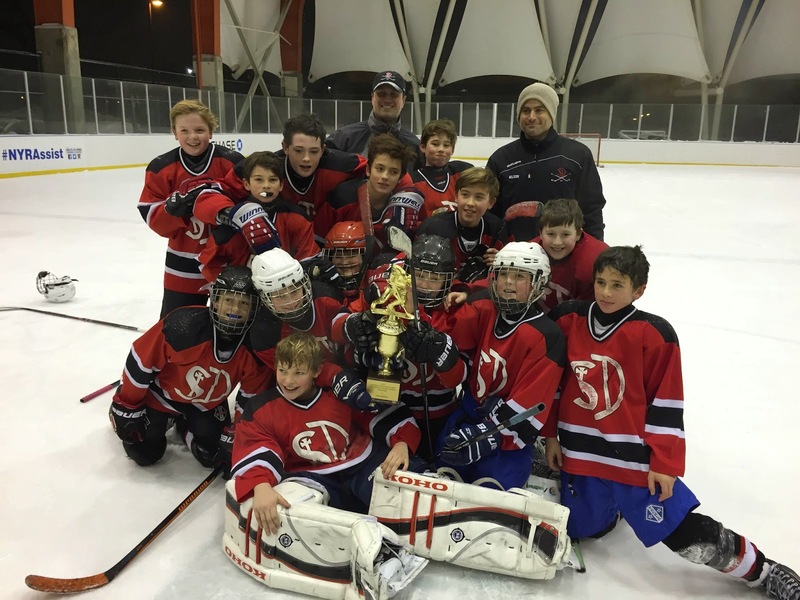 A mixed group of our fifth, sixth and seventh graders participated in a hockey tournament this past Saturday afternoon at Riverbank State Park. This is an invitational tournament to which Saint David's is annually invited based on our reputation. Seventh graders Alex N. and Colin C. led their group to a Championship, with Alex getting the shutout in goal in the final game. Colin showed tremendous leadership and demonstrated great sportsmanship to the fifth and sixth graders playing alongside him. On Sunday, a group of seventh and eighth graders came together and likewise won the Championship for their division. The boys played spirited team-first hockey. As Coach Murphy told me, "Alex K. was a rock in net, shutting out our opponent in the finals. More important than winning the championships, both teams demonstrated all the characteristics of a Saint David's man and were complimented by the other teams' coaches for their performances." 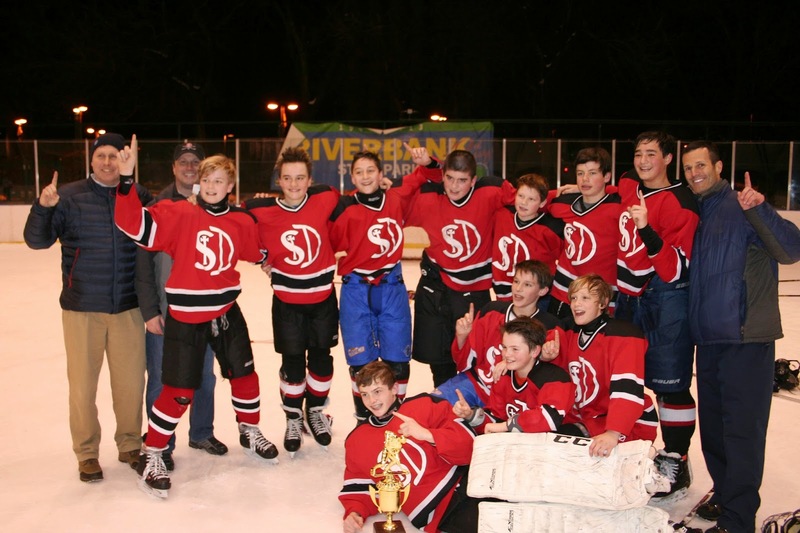 What a great weekend for Saint David's! 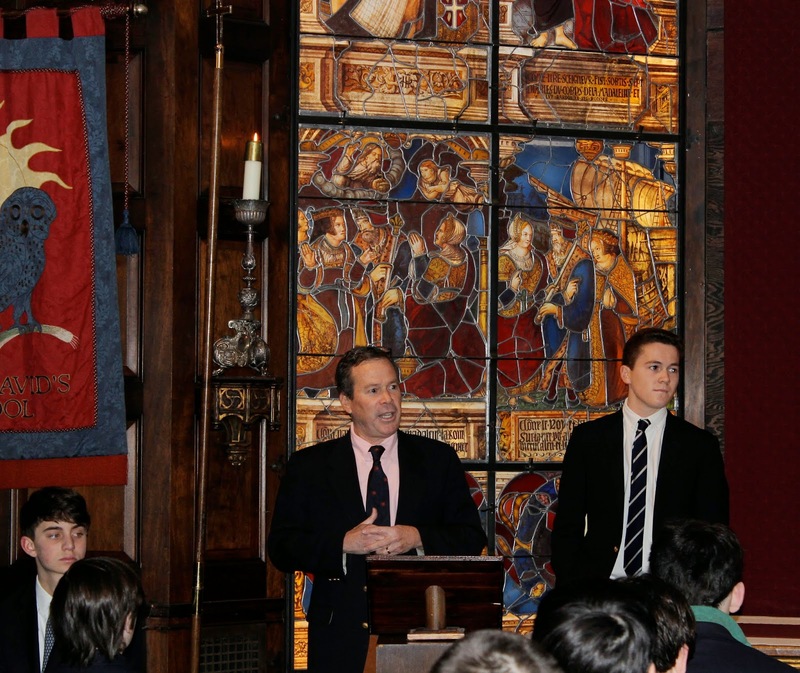 Yesterday, father and son alums Terry Mullin '73 and former Student Council President, Jack Mullin '12, gave a Chapel Talk to our seventh and eighth graders about Saint David's Kalina School in Ethiopia, built after four years of fund-raising by our boys. Terry and Jack were part of the contingent that visited the school with me in June for its official opening, and they spoke about the experience of that trip. It was great to have Terry and Jack back at school. In his talk, Terry mentioned how struck he was by the strong faith of the Ethiopian people and Jack spoke about how happy and welcoming the villagers were. Terry also spoke of the highly significant effect that Saint David's had on his life. Both acknowledged the efforts of the boys present in helping to make the Ethiopia school a reality. 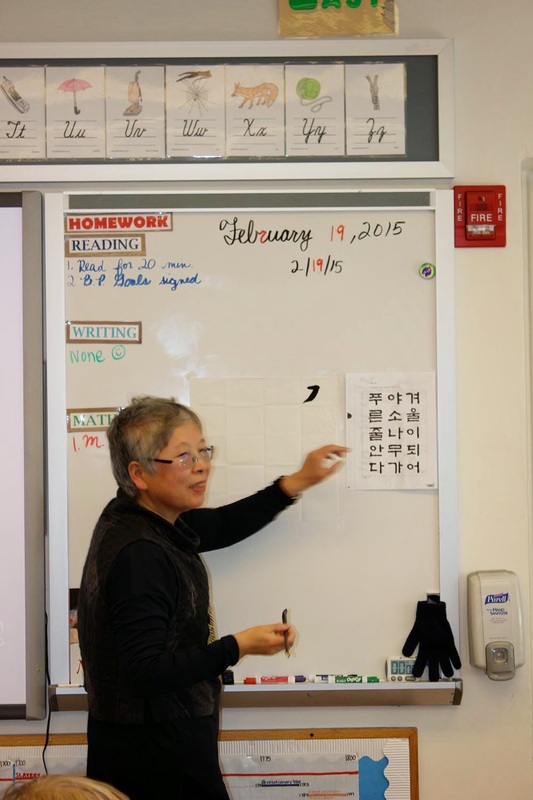 Yesterday, Ms. Sungsook Setton of the Korea Society visited with our third graders for a workshop on Korean calligraphy, as part of the boys' study of culture. The boys learned to properly hold a paint brush to execute letters. They wrote a poem and then learned how to use the brushes to paint a ram, in honor of 2015, The Year of the Ram, in the Lunar calendar. 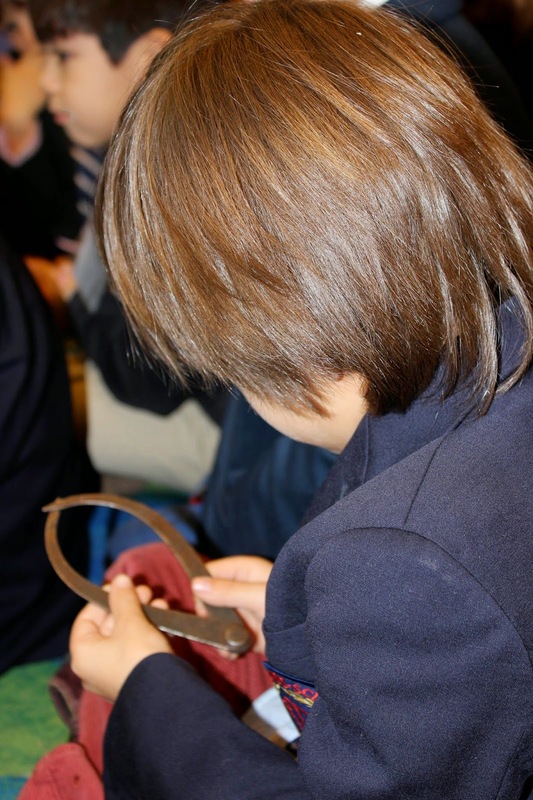 Boys quickly discovered that they needed to focus intently in order to master the brushwork. They asked thoughtful questions, such as where the ink comes from (the soot of pine trees). The boys thoroughly enjoyed the experience and were eager to return home to share their work with their families. The third grade study of culture focuses on the cultures of Korea and Haiti. In early February, the Brooklyn group La Troupe Makandal led the boys in a wonderful session on Haitian music and dance. This was a special opportunity for our boys to explore music and dance as expressions of culture; and to be able to compare and contrast the ways that different cultures use these arts. Forget about the upcoming Daytona 500! Our fifth graders have the Gallagher 300, a race among toy cars, named after their teacher, which helps the boys understand how rate is calculated and how it can be manipulated. The boys, working in pairs, first calculated and recorded the rates of speed of their cars (Mini Cooper, Lamborghini, #28 and Dodge Viper) on a 3-meter flat "track." They then experimented with making modifications to the track, for example by adding a ramp, to see if they could improve upon their car's rate. After two fun-filled trials and a final run, the results were in! #28, fitted with a slingshot, came in first with a rate of 2.21 m/sec. This activity, which required the boys to generate creative solutions a particular challenge, is an example of the application of math to tangible problems that is prevalent throughout our math curriculum. It's also a lot of fun! Under the direction of their teacher, Joe Kilkeary, the boys in 7 Pi did an exceptional job yesterday skillfully performing Euripides' play Iphigenia at Aulis. The story centers around Agamemnon's wavering willingness to sacrifice his eldest daughter to appease the goddess Artemis, and be granted the favorable winds he needs to set sail for Troy. He questions the logic of the polis, with its all-encompassing devotion to the gods and heros. Great job by Jaime A. (Agamamnon), James C. (Old Man), James K. (Menelaos), Charles U. (Clytemnestra), Joseph B. (Iphigenia), Sean O. (Achilles), and Alex N. (Messenger), and all the boys in the Chorus. The boys delivered their many lines with comic and tragic flair, capturing both the humor and moral dilemma of the play. 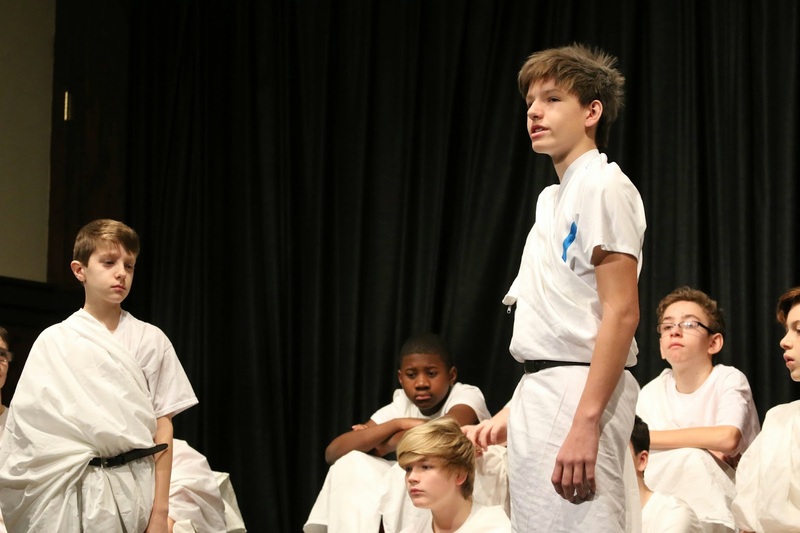 The tragedy is performed in conjunction with our seventh graders' history program, which is an in-depth study of the civilizations of ancient Greece and Rome. I was recently interviewed by representatives of the Save St. Thomas More Church organization, regarding the potential closing of the church. St. Thomas More has been the spiritual home of Saint David's since the school's beginning and its closing would be a significant loss for our community. In the video clip below, I talk about the vital role that St. Thomas More Church plays in the life of Saint David's School and the Carnegie Hill community. For more information, you can also visit Save St. Thomas More's Facebook page. Saint David's held its first London alumni reunion yesterday. The evening celebrated a visit to London by our former master teacher Tom McLellan, who taught at Saint David's for more than four decades before retiring from teaching and joining our Development Office in the fall of 2012. Held at London's beautiful Inner Temple, more than 20 alumni from a span of classes, who live abroad, enjoyed the time spent reminiscing with their former teacher and mingling with each other. Tom tells me that the evening was a great success, and that the alumni send their warm regards to their alma mater. This event was made possible by the generosity of Lady Fiona Hooper (mother of Saint David's alumni William Donnelly '03 and Sean Donnelly '95) and the Rt. Honorable Sir Anthony Hooper, who invited us to gather at such a beautiful venue. Thanks also to Filippo Guerrini-Maraldi '78 and his wife Jennifer for providing the refreshments, and to Alex MacDonald '92 for all the work he did helping to organize the event. 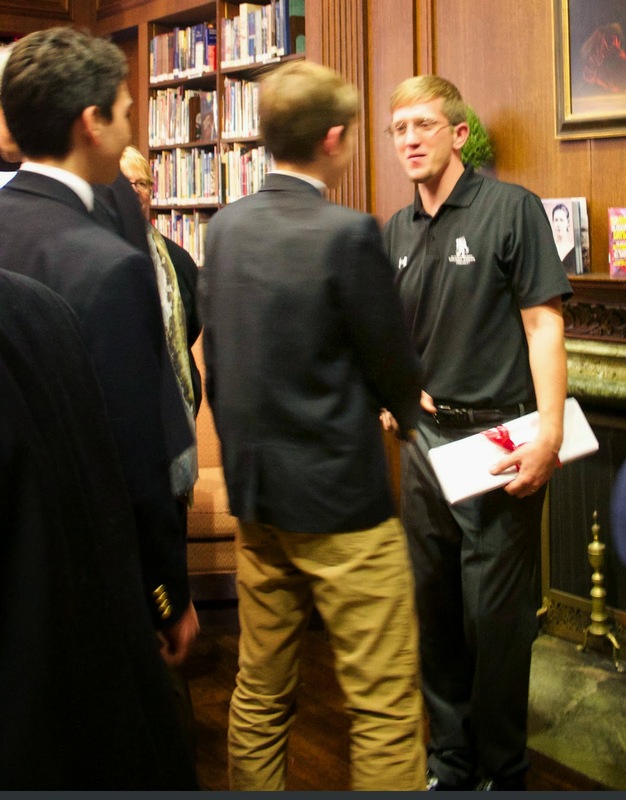 The Saint David's alumni community is strong, both here in the U.S. and abroad. I am always gratified by the deep connection our alumni feel for their first school, and we welcome our alumni to visit 89th Street, whenever they find themselves in New York. 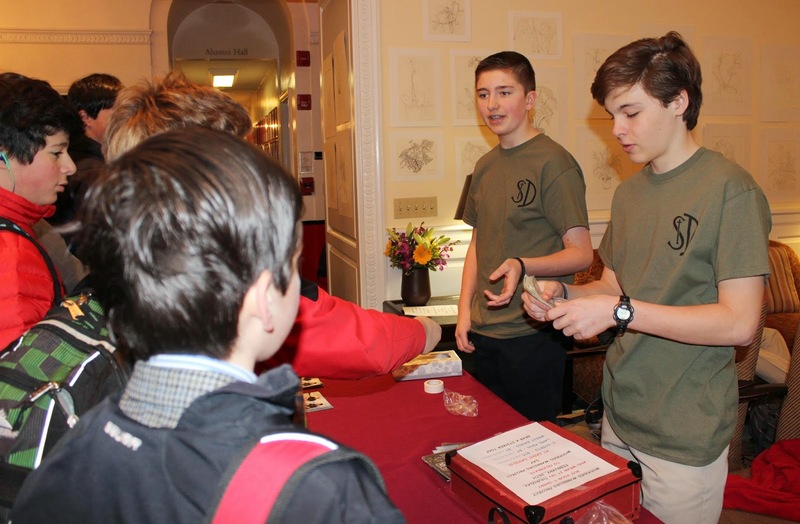 Last Thursday was "DNA Day" for our fifth and eighth graders. Our fifth graders spent the day off campus, at the DNALC Laboratory in Cold Spring Harbor where they solved a forensic science mystery. Using a technique called DNA fingerprinting, the boys successfully identified which of three suspects could be proven to be at the scene of a bank robbery. 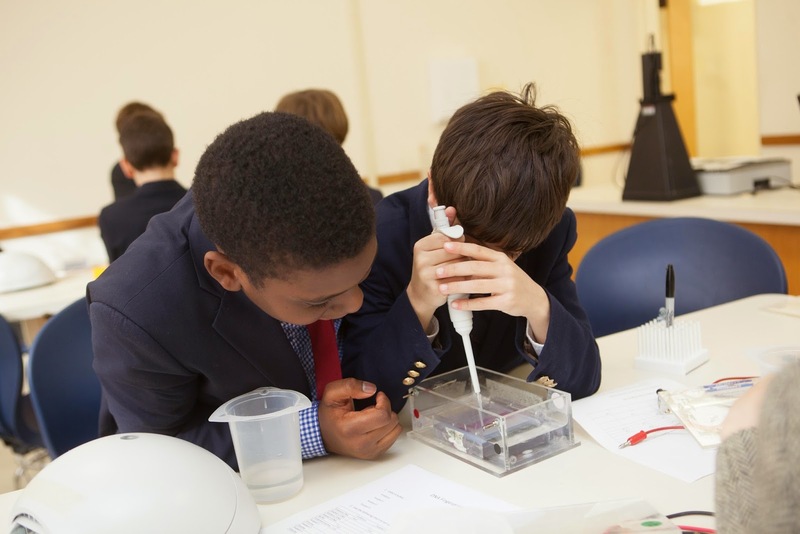 This three-hour lab procedure required the boys to use micropipettors and a centrifuge, and to perform gel electrophoresis. The boys loved the chance to be DNA detectives. 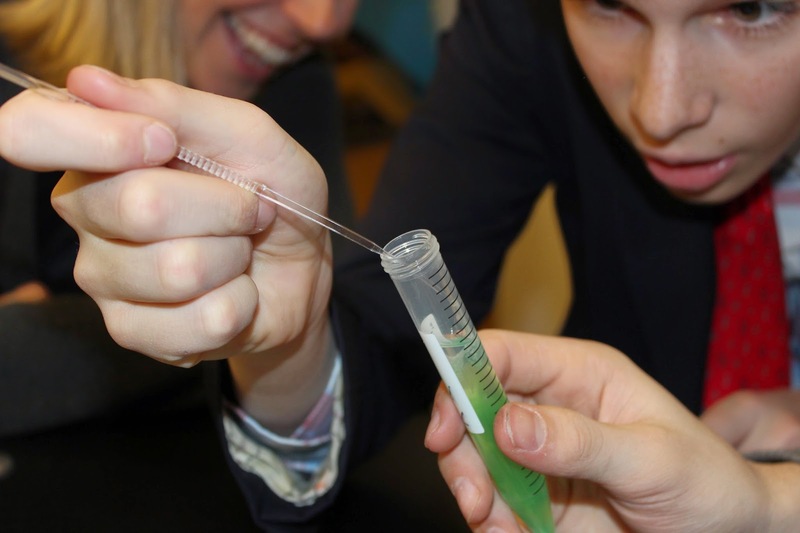 At the same time, back at school I visited our Upper School science lab, where eighth graders were having their first DNA session with a DNALC educator. 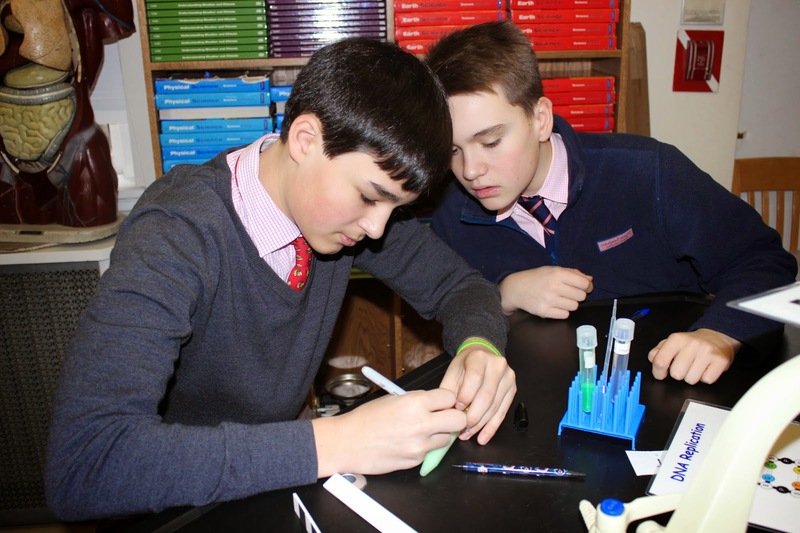 The boys learned about the composition of DNA, made their own models of DNA, and then worked on a lab to extract DNA from a bacteria cell, using liquid soap to break apart the cell membrane and release the DNA. Adding ethanol to the tubes then allowed the DNA to rise in the solution, and be made visible. The boys were thrilled to be able to actually see the DNA without a microscope, something mysterious made tangible! This is the second year of Saint David's collaboration with the DNALC for Fifth Grade, and the first for the Eighth Grade. Our collaboration with DNALC is enabling both grades to gain valuable hands-on experience and insights into DNA science through in-depth work conducted with DNALC scientists. Today, our first graders and their teachers began a new unit on mapping in collaboration with the New-York Historical Society. An educator from the N-YHS visited the boys' classrooms to lead this first session. 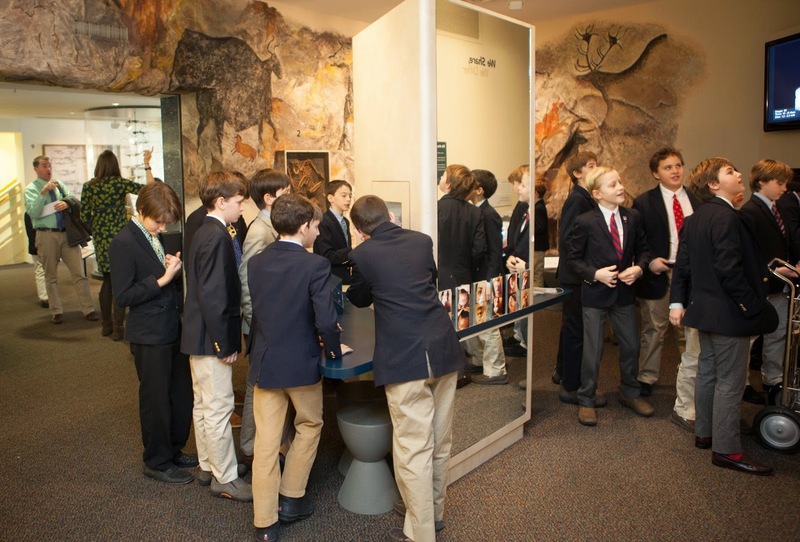 She began by introducing the N-YHS, the oldest museum in the City of New York, and directed the boys in a discussion around the question "what is history?" The class concluded that "history is all the time, it is all around us." Next, the boys were given the role of "history detective." They first had to examine and make observations and predictions about two artifacts from the N-YHS collection that were used in the past for mapping, in particular to measure distances. 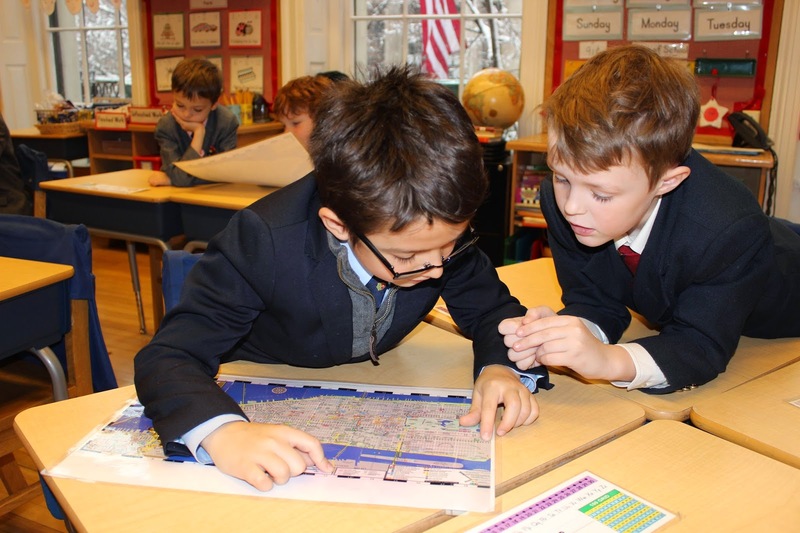 Afterward, the boys analyzed an old map of New York to uncover its features, such as key, color, scale, and compass, as well as to draw inferences about what the map communicates about life in New York. One boy noted that the relatively small amount of green on the map indicated that there were "lots more streets compared to parks." 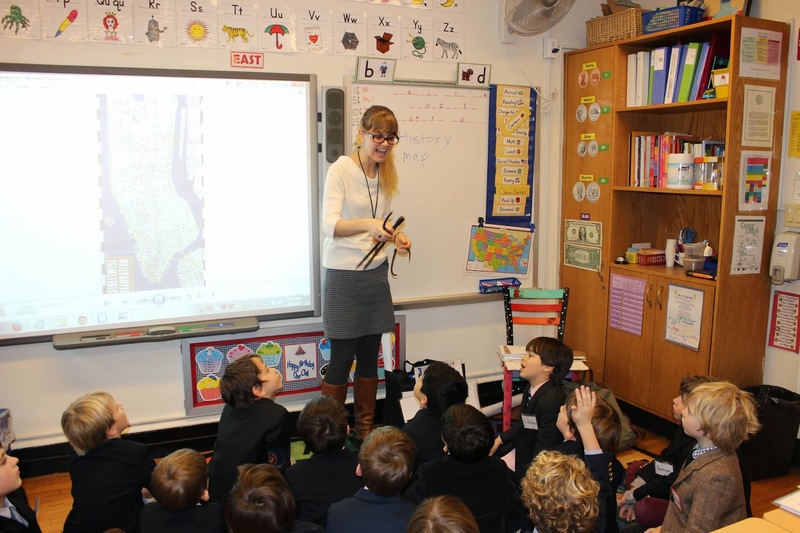 The mapping unit is part of the First Grade social studies program, which focuses on the geography and landmarks of New York City. It is the second collaboration between Saint David's and the N-YHS. Our first, is our partnership for second grade social studies, now in its fourth year. On Friday, sixth graders had their second session of their Digital Universe Field Study with the Digital Universe Flight School at the Hayden Planetarium of the American Museum of Natural History. 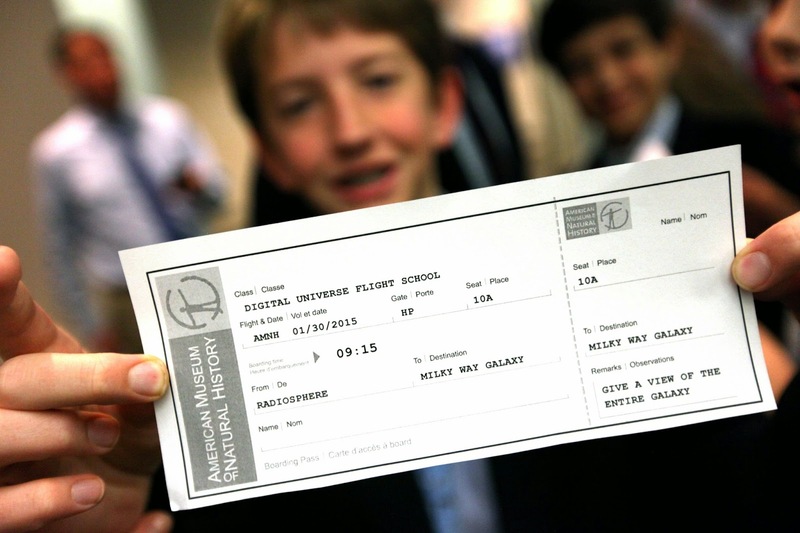 Upon arrival at the museum, each boy was given a "Flight Mission" boarding pass stating the flight he would need to execute in the Planetarium using the Uniview software program. Missions included providing a complete view of the Milky Way Galaxy, flying to Jupiter, and showing the solar system, among others. The boys took turns introducing themselves and then sharing with their peers. Later, they went through stations that explored infra red, UV light, and radio waves, to explore how various parts of the electromagnetic spectrum are collected and used as the data to create our view of the universe. 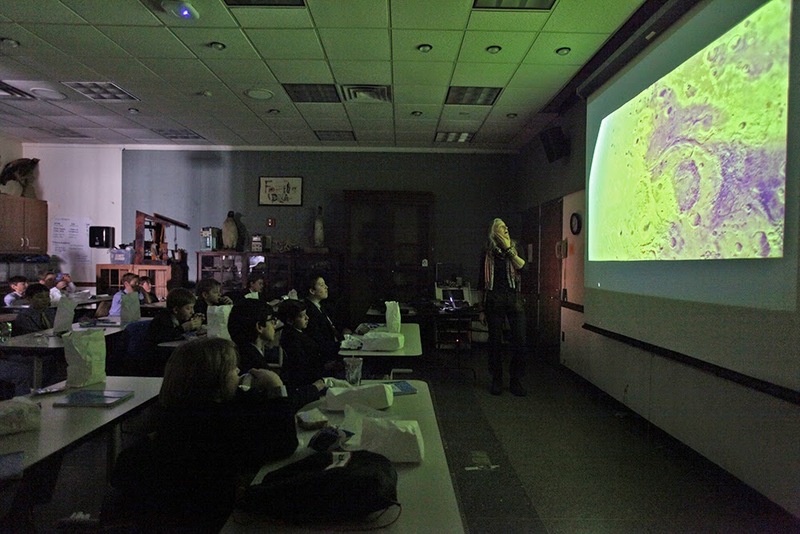 The boys were also treated to an in-person session led by the museum's noted Director of Astrovisualization, Carter Emmart, who uses astronomy and computational modeling to create 3-D tours of the universe. During the next few weeks the boys will work in pairs to produce a 5-minute space show of their choice, for which they will write the script and prepare the storyboards. They will design the show using the Planetarium's Uniview software, narrate it, and present it to an audience. This is the first year of our school's collaboration with the Digital Universe Flight School. The collaboration is in line with our focus on providing meaningful experiential learning opportunities throughout the academic program.